Right now I am handicapped with a hand injury and lingering issues from sickness. That give me time to catch up on some stories and ask others to move trees around so I can putter about for a while. 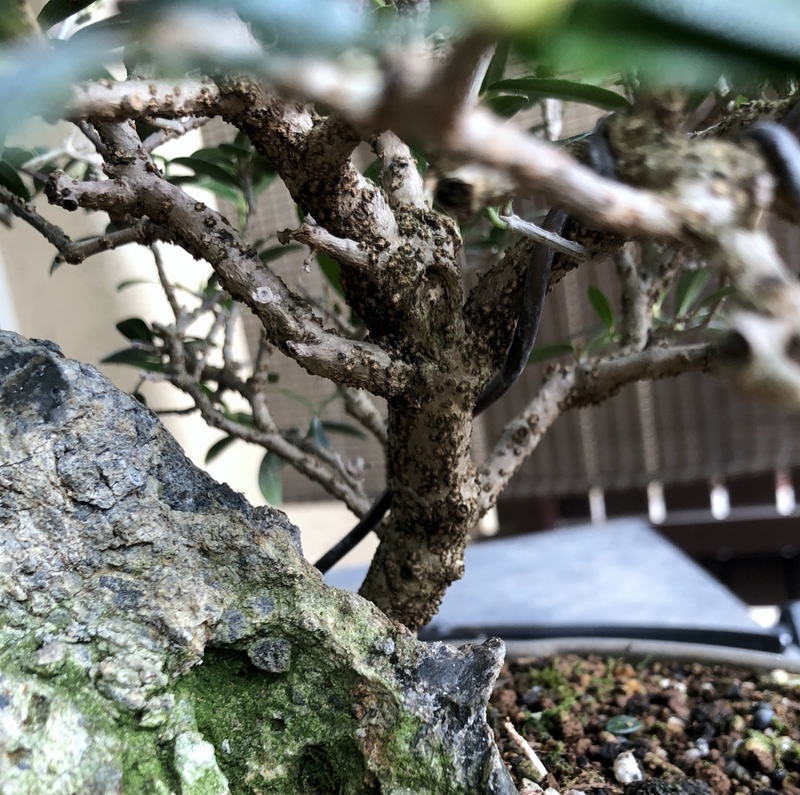 This past weekend the local bonsai club asked if I would demo the creation of a Saikei; a Japanese style landscape planing using rocks and various plant material. They were popular in the US in the 1950s. 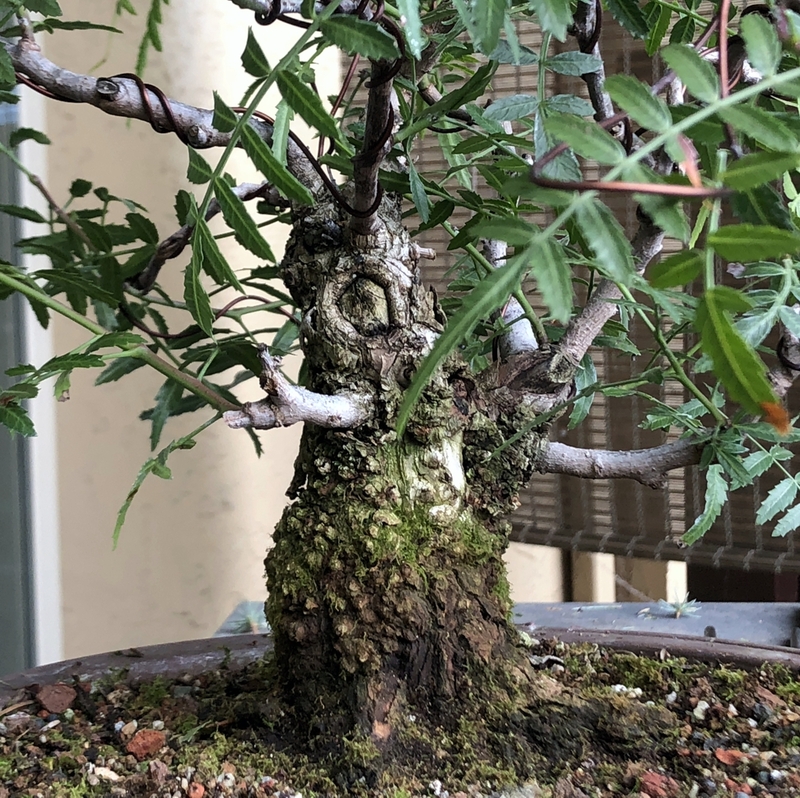 I agreed and produced a fine example but made the comment that I did not generally like them in the collection because they were not classical bonsai, had a mix of species, were too heavy to move around, and required constant attention. Well, truth be told I have one remaining in my collection that is a not to Saikei but not with a mix of tree species or even a specific scene. Olive Saikei front before cleanup. I need to balance the foliage mass on both sides. 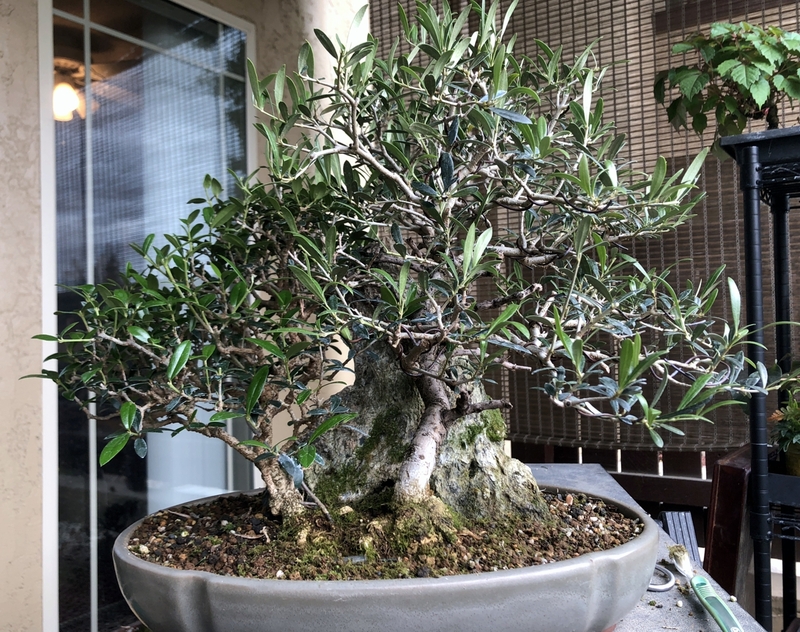 I started this olive Saikei over 10 years ago with two young olive plants and a large lace rock. It has gone to show a few times and is favored because it was hard to tell the difference between the rock and a stump. The trees have developed nicely. 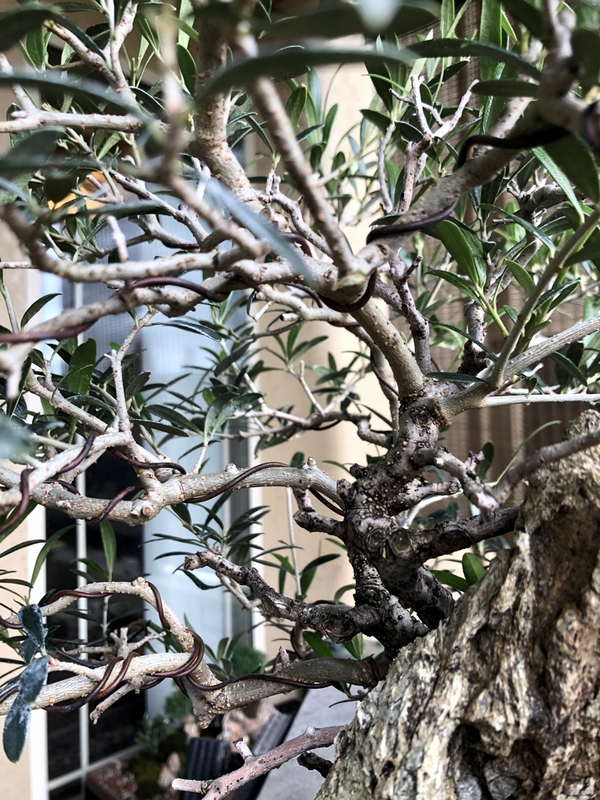 They, like all olives require seasonal care of old foliage removal and thinning in order to keep them healthy. 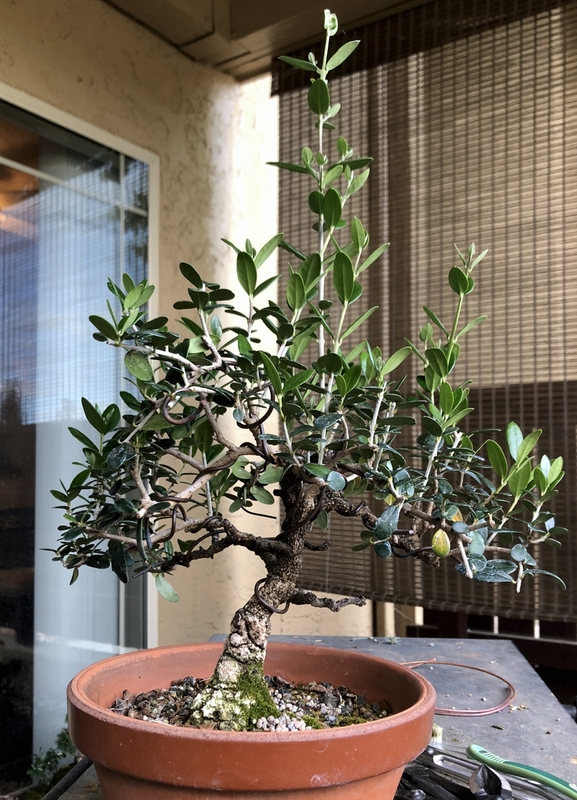 Olive Saikei nebari developing nicely. These were just two Juvenal trees 10 years ago. Olive Saikei prior to clean up. Showing the two trees in this planting that are developing a nice root system. Olive: love to see the bark forming on an olive. This little young twig when I started this planting is being to bark up. Olive transition from old growth to young growth. I am working to redevelop internal branching. Other olives needed seasonal work as well. 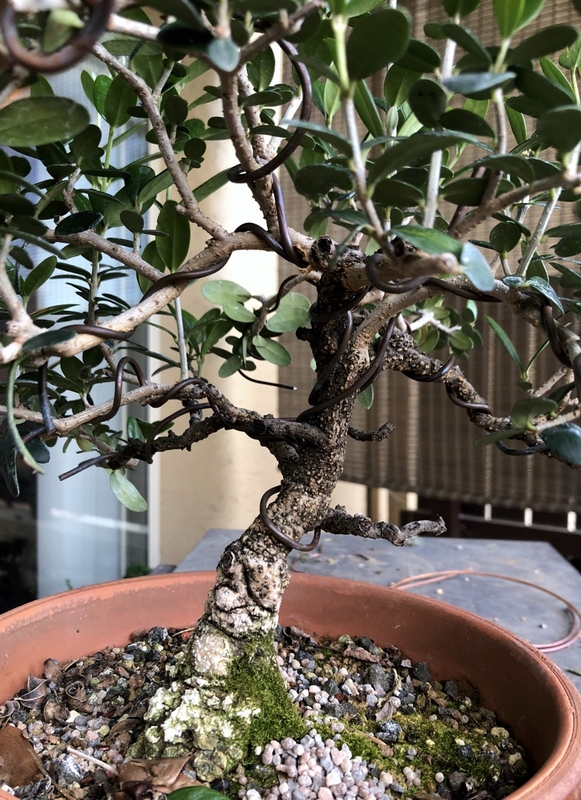 Old olive in recovery, nice bark development. 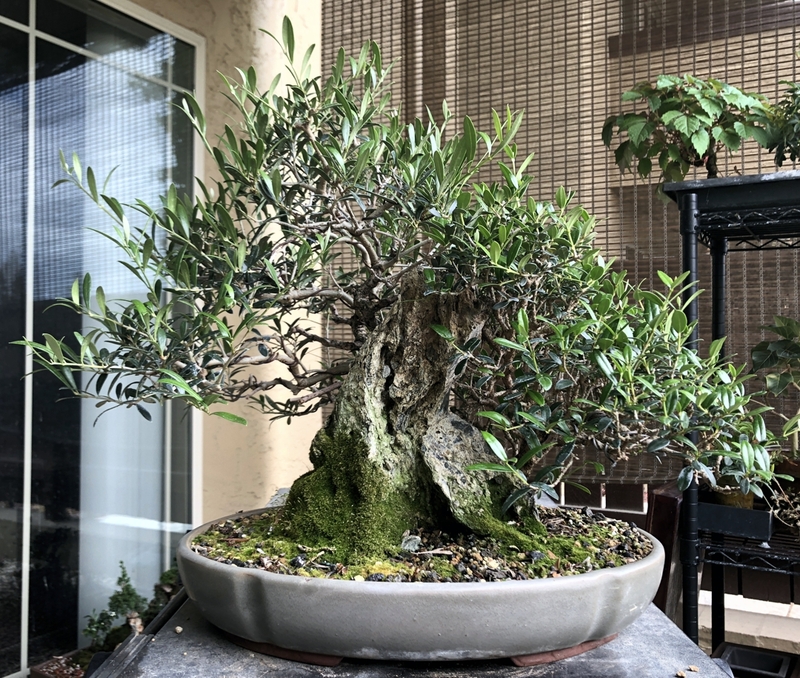 Old olive in recovery. This was a shohin olive of over 20 years of age. It suffered greatly and this is an update on its recovery. This year it will have free range to grow. Then, there was the need to tame the Trident Maple story. This is a new tree in the collection. This year we are working to develop lower branches,thicken up primary ones, and develop an official apex. 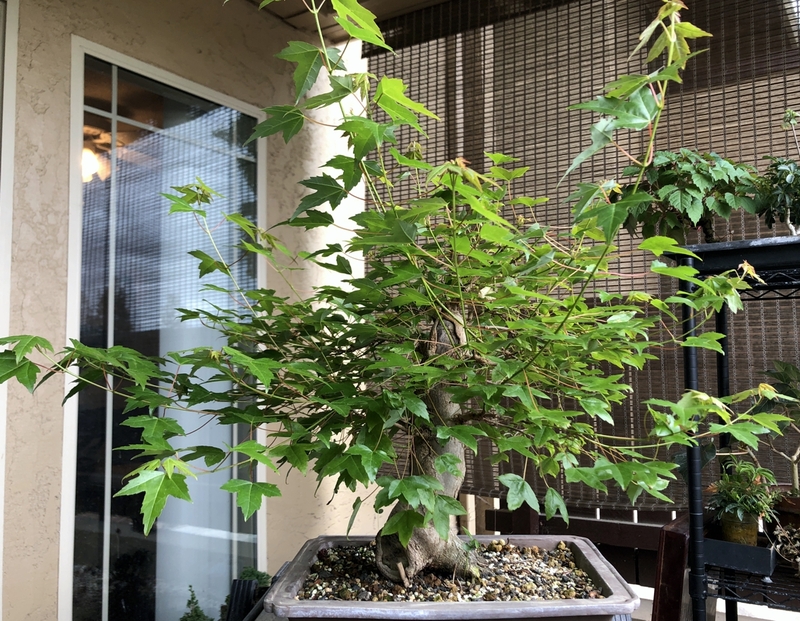 Trident maple after spring flush of growth. We are developing lower branches and curtailing the top growth. 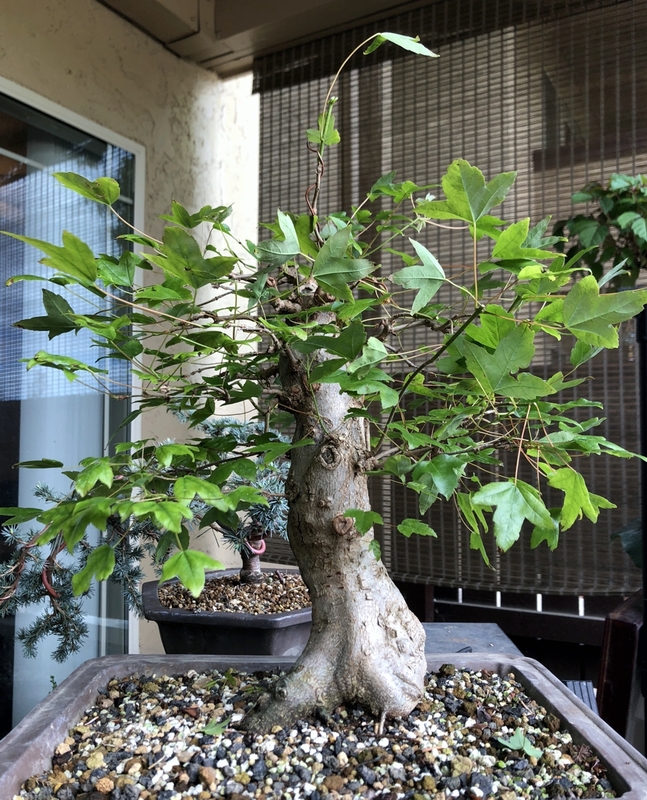 Trident maple after 1st pruning. The horizontal branches will continue to run again to develop those branch thickness while a new apex is finally underway. Then of course I need to revisit a few of my favorite trees. 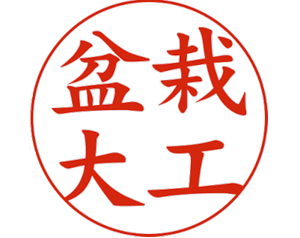 Notes are below the images. 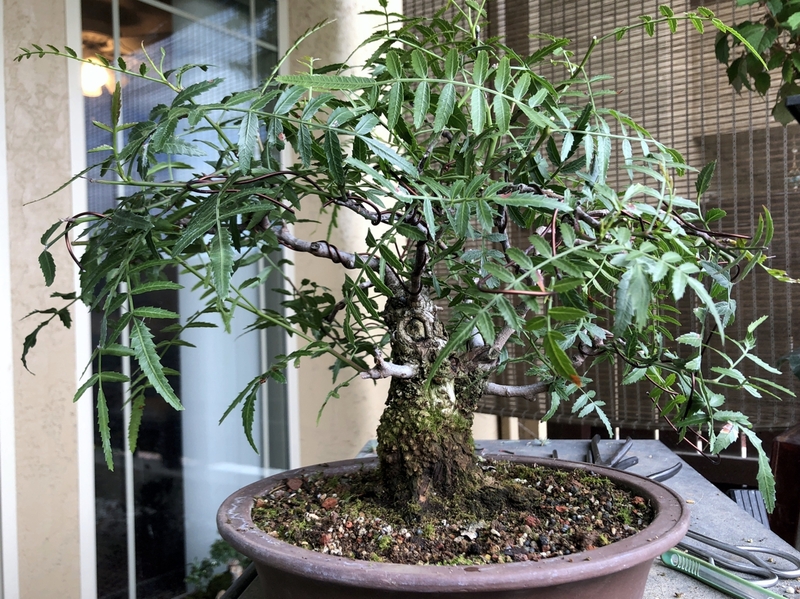 Peruvian Pepper tree this year will undergo a balance of growth in the foliage. Keeping the strong shoot pointed down to move growth to other branches. Revisiting an old favorite. Spring is starting to make the Peruvian Pepper tree to push new growth. This is the trunk detail. 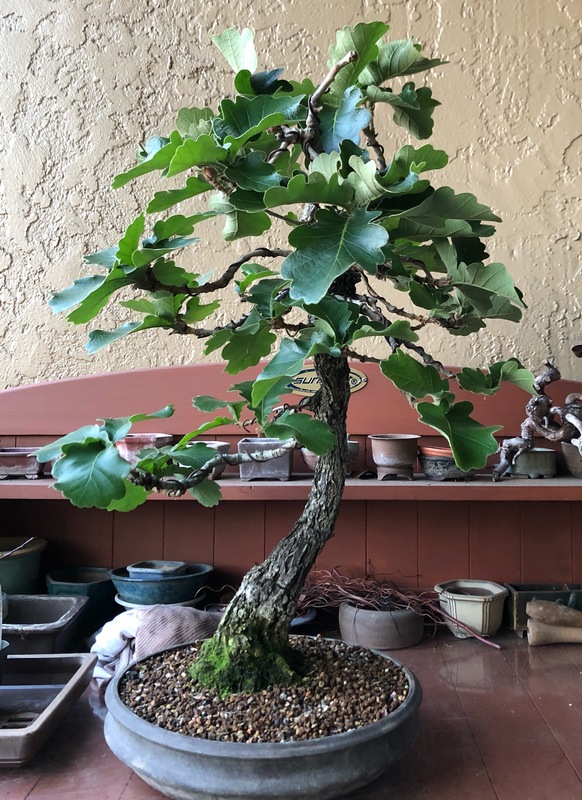 Daiymo Oak with Spring foliage.